June tends to mark the beginning of summer; however, it is also a great time to invest in the workplace, as June is National Safety Month! Having an injury and illness prevention plan is key in keeping workplaces safe and healthy. By creating plans based on industry and the hazards likely encountered by employees, businesses are taking a big step in preventing accidents and even tragedies that could have been avoided. There are also economical benefits, as preventing these from happening also means avoiding the costs of claims, lost time and productivity, and lawsuits. All businesses in Canada and the U.S. are required to have safety training and plans, but different jurisdictions and states have different specifications, so it is important to learn your local laws before creating a plan. Preparation is significant in decreasing the risks of injuries and illnesses and makes a real difference. The average person works for 22.4% of his/her life. As people spend so much time at their jobs, the chances of an accidents happening during work hours increase. The American Society of Safety Engineers has said that workplace injuries can be reduced by 50% with the implementation of a safety program. Per OSHA, injury and illness costs can be reduced by 20-40% with a safety and health program. The Community Against Preventable Injuries in Canada states that 95% of accidents are predictable and preventable. Each year, preventable injuries cost about $16 billion annually per The Community Against Preventable Injuries. In Canada, there were nearly 250,000 lost-time claims during 2014-2016. In the U.S., there were 2,857,200 cases of nonfatal injuries and illnesses during 2016. 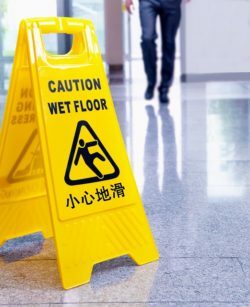 Some of the most common workplace accidents in the U.S. and Canada include slip-and-falls, reaction injuries (slips and trips without falling), and contact injuries (with objects, equipment, or walking into something). The average slip-and-fall accident can cost upwards of $20,000 and result in several days away from work. About 65% of falls occur on same-level surfaces, so proper matting to keep floors dry, and housekeeping to clean spills and remove clutter will go far in preventing these mishaps. Businesses in Canada are required to provide some level of first aid to their employees and guests, but the requirements vary. When accidents do happen, having a first aid kit that is stocked with the all of the necessary supplies is necessary. 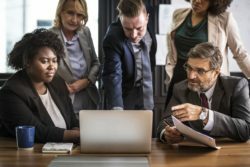 Employees need to be trained to administer care properly, as failing to do so reflects poorly on a business, especially if that employee files a claim. CCOHS provides guidelines on what kinds of first aid kits businesses should have depending on their industry, number of employees, and other relevant factors. When a business purchases their first aid kits from Citron Hygiene, they can also get a regularly scheduled, restocking service to ensure that kits never run out. Get peace of mind knowing your First Aid Kit is properly equipped in the case of an emergency. Two other events that business should consider to preparing for are cardiac arrest and influenza pandemics. Each year, there are about 40,000 cases of cardiac arrest in Canada and in the U.S., around 10,000 instances of this happen to people while they are at work. 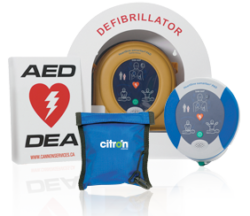 An AED may not be used at all, but having it there shows employees and guests that their safety and health matters. Illnesses are considered a safety issue for businesses as they can affect a large number of people quickly, and cause great disruption in productivity and become costly to manage. Pandemics are a large-scale, worst-case scenario version of an outbreak in the workplace. They are defined as “unpredictable, but recurring events that can cause severe social, economic, and political stress” per the World Health Organization. 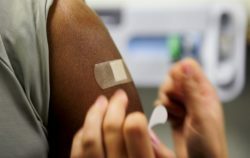 Absentee rates can be as high as 30% during peak pandemic periods, but having a plan and supplies in place could lessen this. At Citron Hygiene, “Building Healthy Spaces” means more than providing a fresh, clean environment for our clients’ staff and guests, it means preserving the health of everyone who visits the locations we serve. For this reason, we offer life safety services that can be adopted by businesses large and small. Visit our website or schedule a free consultation to learn more!